I made this collage back in the golden days of collage (when a favorite family activity was making collages from catalogs that came in the mail). I used to make collages filled with puns. The back of this one has a picture of a jack (as in the game of jacks), a playing card jack of hearts, and a donkey, but the composition is lousy so I'm not showing it to anyone. This collage is a play on balance, justice, and equality, but it is a really useful tool for me to keep on my wall so I can glance at it while I am practicing. It reminds me that playing the violin or the viola requires balance of both sides of the body, and strength in the center. I realized only recently that many of the problems I have with tendonitis (and I get it in both forearms) come from over using one side of my body when I should be simply using both sides in balance. I just thought I'd share this image here. The image might help other string players who experience forearm tendonitis. Luanne Koper read Shelley's "Mutability" at the memorial service for our friend Rob Zseleczky. She read it because Shelley was Rob's favorite poet, and because it was entirely appropriate for the occasion. It was when she read it that I was first able to cry. The poem was slightly familiar to me because the last two stanzas appear in Mary Shelley's Frankenstein, but I had otherwise never heard or read the poem. All the years I heard Rob talk about Shelley (and there were many years, and much talk of Shelley), I never read any of his work. 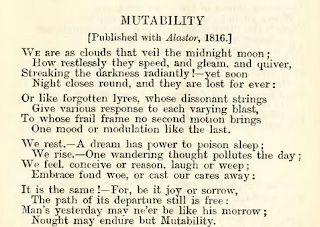 I considered setting "Mutability" as a song, but it is one of those poems that doesn't need music to make it better understood, and using music to illustrate a reading of it would only prove a distraction. I ended up writing a 3-minute piece for violin, viola, and cello about the poem, and it really helped me to work through some of my grief. And I think I'll spend some time reading more of Shelley's poems. 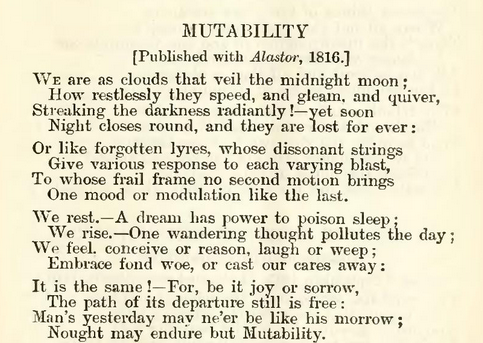 You can listen to my wordless setting of "Mutability" here. You can read Michael's posts about Rob (including one of his poems) here. You can download the score and parts here. Meredith Willson Wrote This Gym-Class Classic! I vividly remember the six and a half minutes of torture that accompanied this rousing gym-class classic of the 1960s. I found the "chicken fat" part really disturbing when I was a child, but now that I listen to it from a musical standpoint (without the insecurities that children have about their growing and changing bodies), I find it charming, rousing, and rather brilliant. Peter Buffett's Op-ed in yesterday's New York Times is well worth reading. Musicians and people interested in the future of music should read it with the idea in mind that Peter Buffett is a composer who, by accident of birth, has an interesting "seat" in the arena of how charitable organizations work. Donations to musical organizations, you might recall, are considered "charitable." Now that we have all grown (and groaned) out of viola jokes, there's a new breed of humor afloat. Lying in the very same range as the viola (minus the C string) is the countertenor, and tucked away on Andreas Scholl's website is a page of Countertenor Jokes! How many countertenors does it take to change a lightbulb? Two. One to screw it in and the other to say "Isn't that a little high for you?" I have to warn you that the site is rather tasteless and is peppered with crude gif animation, but I'm sure that you will find something to make you smile. I did. 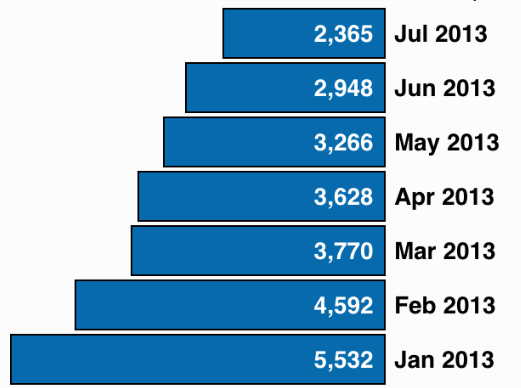 Last April I noticed that the once-vibrant musical blogosphere had started to slow down. It used to feel very rewarding to write about ideas, post links, and use the little corner of the internet where I squat in whatever manner I chose to use it. 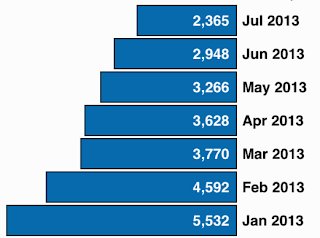 Lots of people read my posts, but the number of people who come to my blog has dwindled down to less than half over the last six months. I have been writing at about the same rate, but no matter how much I "give" to the Musical Assumptions "audience," it doesn't do much to stir the pot. The kinds of musical discussions that used to be on blogs seem to have migrated to Facebook, but they occur in miniature, and they can occur in real time. I guess in this on-line world you have two options: Facebook or Google, and it looks as if Facebook has won. But I'm loyal to my faithful readers, and I will continue to write here. August 12th Update: Here's more about this subject. 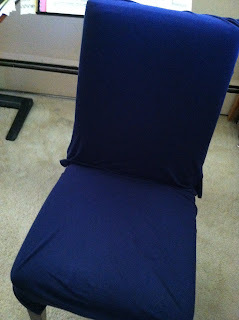 Emergency Upholstery With or Without Sewing! 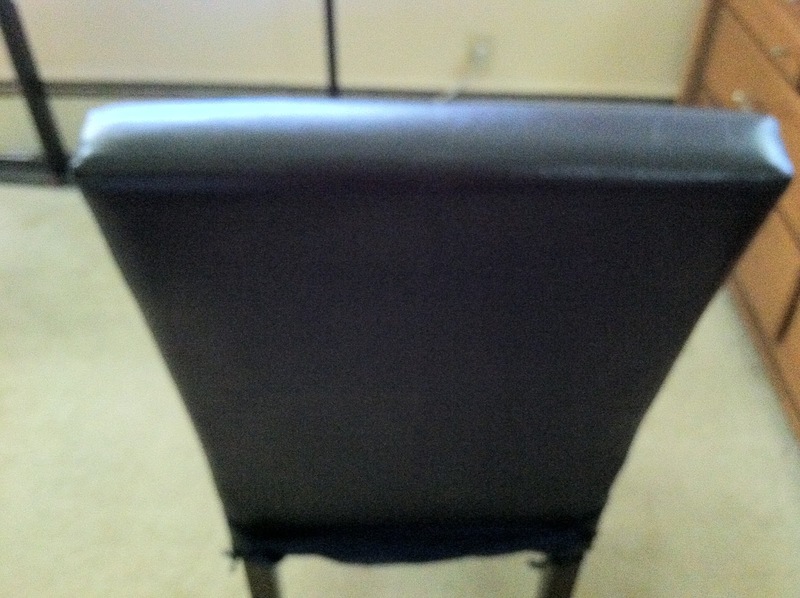 I have a great chair that I use for practicing, but it is upholstered with faux leather (i.e. plastic), and it can get uncomfortably hot and sticky after a while. My practically cost-free solution? 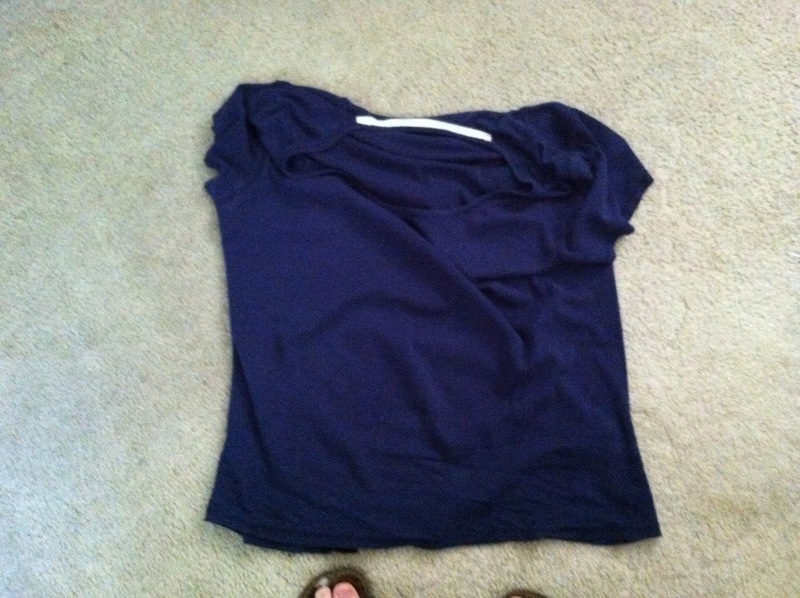 Take two old T-shirts, and some straight pins, and follow me! It will take you ten minutes at the most to do. I used two worn-out cotton T-shirts, one for the seat, and one for the back. If you slide the arms of the seat shirt through the legs of the chair, it should stay in place. 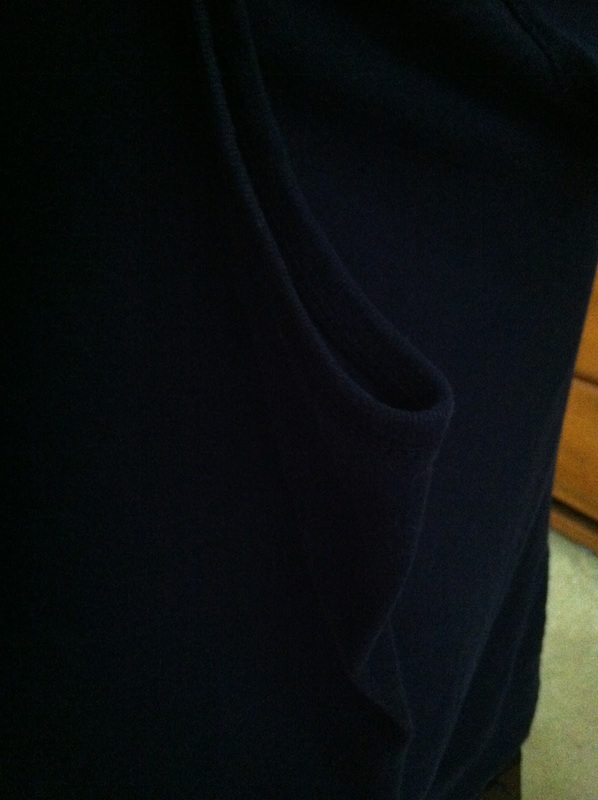 A rubber band or some kind of tying device of your choice on each leg will keep it snug. 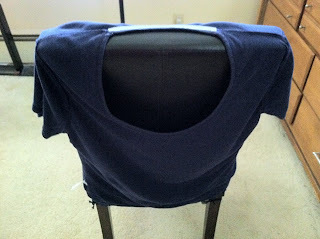 Turn the shirt inside-out, and slide it over the back of the chair. Starting from the edges and working towards the middle, pin the hole that is meant for your head together. Now pin the arm holes shut. 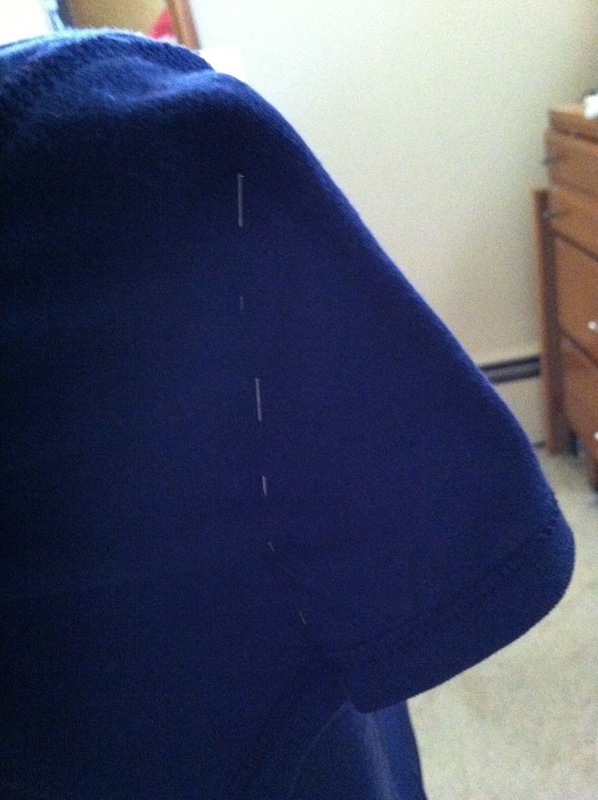 This is hard to see in this photo, but the last step is to pin the back seam all the way down. Turn the shirt rightside-out, and slip it back over the chair. Here is how it looks before sewing, which is pretty much the same way it will look after sewing (which you don't even have to do!). 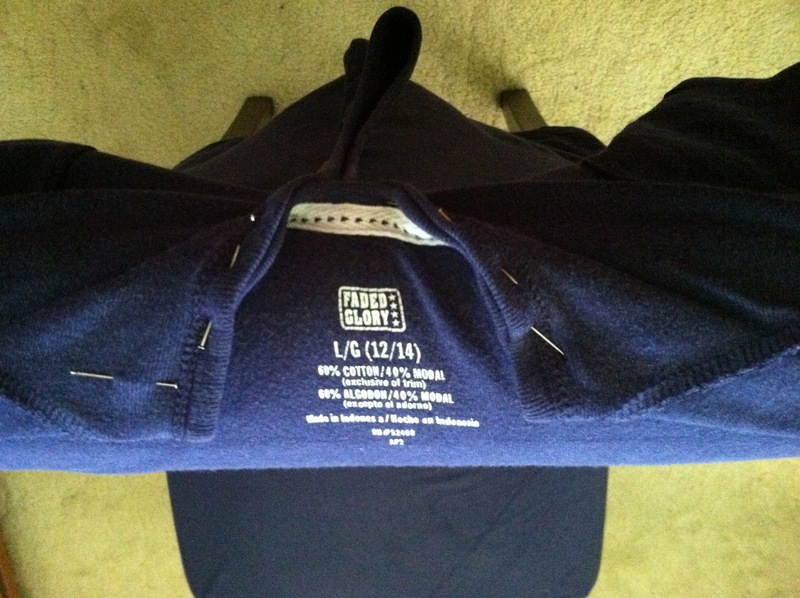 All the pins are on the inside of the shirt and on the back of the chair, so there is no chance of getting stuck. KOZINN: You studied classical music formally, didn’t you? PARKS: Yes. In 1952 I went to the Columbus Boychoir boarding school, near Princeton, and that same year I was on the stage at the Metropolitan Opera, with Victoria de los Angeles — I was an urchin in “La Bohème.” Our choir worked with Beecham, Ormandy, Mitropoulos, Walter, Toscanini — all of them. I had an immersion in legitimate music that is absolutely indescribable in its abundance and opportunity. Now I’m caught in no man’s land. I’m not “legitimate” because I lie down with dogs. And yet, doggone it, I’m not a rocker because I work with a premeditated intent. So I’m not really at home in either camp, but I’m at home between them. 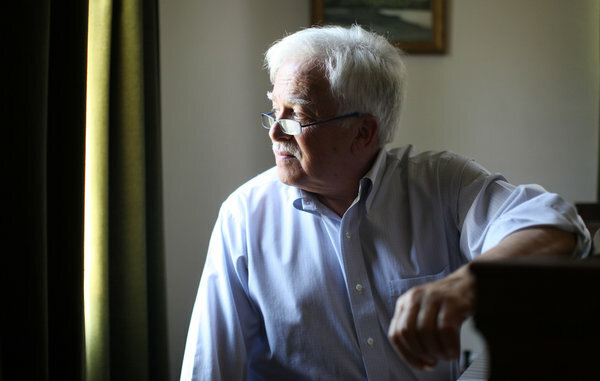 From Allan Kozinn's interview with Van Dyke Parks in today's New York Times. Edouard Vuillard painted "Le concert matinal" during 1937 and 1938. It is connected with the Place Vintimille, which is now called the Place Adolphe-Max (as of 1940) in the 9th arrondisement in Paris. I imagine that Vuillard's musician friends came into his studio (notice that the music stands are artist's easels), and I imagine that the piece they might be playing is the Jongen Trio, Opus 30, because it is a piece of the period (1907), and also one of the few pieces written for violin, viola, and piano. The music on the stands also looks vaguely like the printed music. Here's the link to it in the IMSLP. I wonder if the violist is the dedicatee of the piece? I wonder who he is? I wonder who the fiddle player is? UPDATE: The picture is of two violinists: Leon Nauwinck and Madame Ortmans-Bach, and the pianist is Claude Crussard. The music is probably a baroque triosonata. Le concert matinal, place Vintimille depicts an intimate scene wherein three musicians, two violinists and a pianist, have staged an impromptu concert. The "salon" in which the musicians have gathered is in fact Mme Vuillard's private chamber in the apartment she shared with her son on La place Vintimille. 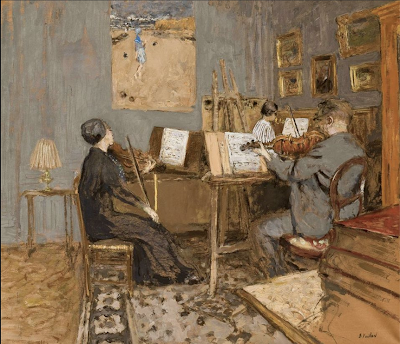 "The renowned violinist Léon Nauwinck was fond of painting; he knew that Vuillard enjoyed music, and consequently got into the habit of dropping by from time to time to soothe his morning doldrums, shortly before lunch, accompanied by Mme Ortmans-Bach and the pianist Claude Crussard. The easel and the drawing-table served as music stands. There were never more than three or four of us to enjoy these sessions, which were held in Mme Vuillard's bedroom, thereby adding fervour to the pleasure of listening to the music of Bach, Telemann and Vivaldi. Annette at Villerville and Bonnard's screen [both] figure in this masterly brush-and-distemper- sketch that us the very incarnation of life" (J. Salomon, op. cit., Paris, 1968, p. 177). Relatives of Vivian Fine (none of whom are related to me) have put recorded interviews with her and transcripts of other interviews on the IMSLP. You can find them here. In 2003 Raoul Ronson, the owner of Seesaw Music, offered to publish my music. It was an arrangement that worked out well for both of us because he liked what I wrote, and he worked diligently to promote it. He was happy, and I was productive. After Raoul's death in 2005, his vast inventory was absorbed by Subito Music, and somehow in the infancy of web-based commerce, much of my music didn't make it onto their website. I had it listed in my on-line thematic catalog, (that link goes to the Seesaw Pieces that are housed at Subito) but aside from using the copies that Raoul sold to libraries, there wasn't any way that anyone could play the 30 pieces that slipped through the data-based cracks. I waited patiently, assuming that the problem was something that would correct itself with time. That time has come, and you can see it all here. I spent much of today and some of yesterday pasting direct links into my thematic catalog, so I guess I am now engaging in a bit of e-commerce. Or I guess I hope to be. New York to LA in 45 minutes! That's the way to travel! Here's the article, and a website about it. I am now the proud and mildly boggled owner of an iPhone 4, so last night I went searching for an app to use for recording. I came across one called MTSR that is free (which means it runs an prominent advertising banner that you have to ignore). It allows you to record four tracks, and gives a nifty little countdown so that you know when to start. It has a button that allows you to make a looping track or a normal track that doesn't loop (both of any length), and it allows you to delete individual tracks. It's a nifty little tool. I plucked something rhythmic into the first track, put on headphones, and bowed something over the plucked track. Then I played something over the two tracks put together, and added a fourth track. It was easy, it was kind of mindless (like all improvisation should be), and it was fun. Was it a composition? No. Not really. Was it worth saving? No. Not really. Sometimes I think that improvisation is more like conversation (particularly when it is conversation with an actual playing person rather than a recorded utterance in the same musical voice), while composition is more like putting ideas into writing. I don't edit my solo improvisations. I often don't remember them. They are often not worth remembering. I don't edit what I say in my conversations, and I always remember more of what the other person said than what I said, because while my conversation partner was talking I was actively listening. Improvising with myself is fun, but it is just about as stimulating for me as talking with myself. Or looking in a mirror. I prefer the "single-track" approach to improvisation without a recording device to capture the moment. Once in a while, through improvisation, I come upon a musical idea. After I write it down (I have a lousy memory), I might use it for material for a composition, which I will edit far more ruthlessly than I would any piece of prose. Through this recording device (which is a great tool), I came to understand much about the current looping-based (or ostinato-based) method of "composition" that a lot of instrumentalists not trained in the craft of counterpoint do. Their editing is done on the machine itself. Since they use the recording machine with the same integrity that they use their instruments, the machine sets their limits. Meters and tempos are often constant, and it's very easy to make the countdown the tempo. Dynamics seem to be best regulated by the machine rather than by the player, but I don't know if you can download the data to manipulate elsewhere. Me? I'll stick to my tried and true ways of writing music, and have a new respect for doing cooperative improvisations with people who have musical ideas other than my own. The dog days of summer, and the technologies that have entered our lives of late, have prompted me to update my New Branches of the Bach Family Tree post. Knitting is something that people do for relaxation, but it is something that always makes me nervous when I try to do it. I can never trust that I will have the right number of stitches, and what for most people ends up being a square or a rectangle, becomes some kind of lopsided triangle in my hands. I love the idea of knitting, but I am keeping my relationship with it conceptual. The other day I met an extremely interesting woman who is not only a knitter but a knitting "composer." 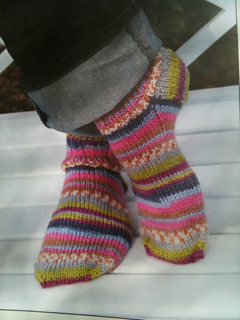 She designs patterns for other knitters, and publishes knitting books. She also spins her own wool, keeps a garden with flowers she can use for dyes, and is a font of anthropological and historical knowledge about the practice of knitting. You could call her a "dyed in the wool" knitter. Here's a pair of her socks. We got to talking about music, and it was not at all surprising to her that in addition to being a performing musician, I am a composer. It went hand in glove (to use a knitting metaphor) with the idea of designing and knitting, or making designs and making them available for other people to knit. She is happily involved in the world of internet commerce. Knitters all around the world get great pleasure out of following her patterns and wearing their handiwork. I found myself a little bit envious of her ability to make money with something I would have considered a hobby before our conversation. In the current e-commerce world, what I do is much more of a hobby than what knitting pattern designers do. They fall into the category of "makers," and some of them even think of themselves as artists. I just write and play music. I began writing music with the intentions of a craftsperson. Once I had enough technique to manipulate my materials in more than a functional way, I held the lofty ideals of an artist, and I had the expectations that my musical successes would be reflected by some kind of monetary reward. And there were a few good years (financially speaking and relatively speaking) when I worked with a publisher who took a keen interest in the music I wrote (and in me and my family). Unfortunately that publisher is no longer living, and the music of mine that he published is available, but it is heaped in a large digital mass with nobody to promote it except me (and I'm not very good at self promotion). Now I feel more like composition is a hobby, kind of like knitting. I believe that I am much better at what I do now than I was during the handful of years when I felt I was on the path towards commercial viability. Those outside of music would say that making new music available for free (as I have been doing for the past several years) gives a signal that the music I write is not worth selling. I'm not quite sure what people inside the world of music think, because we are all living in the same larger world, but I like to think that some of them might be grateful not to be "customers" in a world where people who play music are far greater in numbers and less and less in demand as professionals. I came across a great post by Matthew Guerrieri over at NewMusicBox that address the problem of music (and art) in a capitalist-modeled world. It provides excellent food for thought. Melanie Kupchynsky mentions Samuel Applebaum in the forthcoming memoir about her father, Jerry Kupchynsky, that she wrote with Joanne Lipman. (There will be an extensive forthcoming blogpost about the book closer to its release date of October 1.) I never really associated Samuel Applebaum with any place in particular, but when I was in New Jersey this past weekend, I got a sense of violin-ness about the place. I had my violin with me because Michael and I were there to play at a memorial service for a friend we always played with in New Jersey (every year for more years than I can count), and there was plenty of travel time for me to think about the book I had just read, and to think about Samuel Applebaum, and how much he meant to me. My first encounter with Samuel Applebaum (who I never met in person) happened in the fourth grade when I started violin lessons with Clara Benson. String Builder was the book we used. It was the book everybody used, along with Wohlfahrt and Seitz. 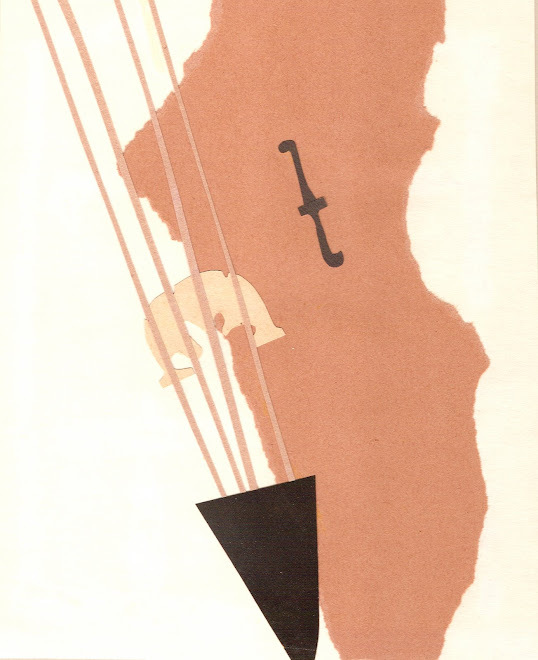 We also used String Builder books for orchestral music. When I stopped playing violin at the end of the sixth grade (I believe that the Seitz Concerto #5 was my "ultimate" piece), I tucked Mr. Applebaum's name fondly into my memory, and went on to other things. My father had a volume of The Way They Play, a rather dowdy book of interviews and photographs of violinists. He had that volume in his library because there was a photograph of one of the instruments he used to play in it. The violinists and other string players in the books were photographed in dowdy houses sitting on dowdy sofas, and they talked about their bow strokes, the way they practiced, their teachers, their instruments, and about music in general. There was no glamour, but I was fascinated. The books were inexpensively printed, and the covers were direct and to the point, like the String Builder books. This was the same Samuel Applebaum. I didn't think much about Samuel Applebaum until I read the whole 13-volume run of The Way They Play when I arrived at my nesting spot, flute in hand, in Charleston, Illinois. The books were in the university library, and reading them had a great deal to do with my decision to re-claim my identity as a string player. I also learned that Michael Tree, the violist of the Guarneri Quartet, was Samuel Applebaum's son (the apple doesn't fall far from the tree, right?). Being partial to the dynamics of musical families, I found this relationship rather interesting. When I first decided to try my hand at the violin again, I found a book in the String Builder series that discussed the bowstrokes that you can do on the violin. I understood the importance of articulation on the flute. There are a couple of ways you can vary tonguing on the flute, but most of the conscious articulation choices have to do with whether to slur or tongue, not in which way you slur or tongue. Applebaum explained in absolute and physical terms exactly what the bow could do, how you make the strokes, where you make the strokes, and, most of all, why you make the strokes. Violin natives understand this stuff from observation and years and years of imitation, but since I was not really a violin native at the time (I was in my early 30s when I started playing again), I needed clarification. I was happy to see that Jerry Kupchynsky had studied with Samuel Applebaum at Rutgers. Melanie Kupchynsky refers to Samuel Applebaum as his mentor, which speaks volumes to me. Applebaum's legacy lives on, but only in a small way. In 1981 he founded the Society of Musical Arts in New Jersey, and their website reveals that they keep the dowdy values (i.e. non slick values) of their founder. There is very little about Samuel Applebaum on line. I found this discussion, but wasn't able to find anything else out about this man who gave so much to so many string players, including Jerry Kupchynsky. Now volumes of The Way They Play are extremely expensive, and Michael Tree, Applebaum's son, is one of the patricians of the viola. During the 1970s the Suzuki method of teaching (teaching very young children to play at a rather high technical level before they can read music) eclipsed Applebaum's no nonsense approach to learning to read music at the same time you learn to play (and perhaps at not so young an age). Perhaps the success of Strings Attached (and it's sure to be successful because it is a great book), will lead people to value the dowdy world of string playing in New Jersey. 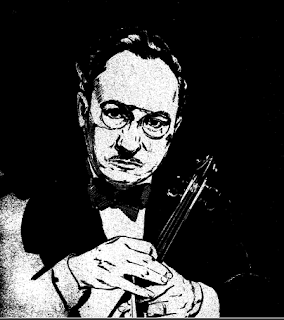 Update: you can listen to a recording of Samuel Applebaum explain how to make the various bow strokes used on the violin and the viola here. My friend Bernie Zaslav, who studied with Lillian Fuchs, sent this recording of the Three Madrigals that Martinu wrote for her and her violinist brother Joe. I’m a creature of cyclic habit. It seems that I engage in the same kinds of activities at various times of the year, and sometimes the activities coordinate to the week or the day. Date books, blog posts, lists of pieces I have written, and online activities give me a map that I could probably plot out physically. A friend of mine who was in search of something he couldn’t find called the other day to see if I might happen to have it (a DVD he sent me years ago). Sure enough, I found it immediately and popped it in the mail. This is not the first time this has happened with this particular friend. He said that I was always dependable. Dependable. That’s me. Always there and always on time. I suppose you could set a clock by my activities. Or a year-long hourglass. I have pretty much done everything in my life according to biological plan (as my last few blogposts, minus the dots--which have nothing to do with biology--have time-stamped). July is always a dull time. Dull and hot. This year the dullness and hotness is enhanced by the seemingly endless wait for the person who installed our air conditioner to arrive and make our house dependably comfortable. Pretty much the only playing I have been doing is practicing, and I have to limit that because of my tendons. I also find that practicing the violin is less stressful on my left elbow than practicing the viola, so I’m happy that I have an alternative to not practicing. Not practicing is very unhealthy for me. Our soon-to-be son-in-law (how’s that for hyphenation) put a video of Rachel performing in a cross fit competition (she won second place) on Facebook, so I re-joined Facebook in order to see it. It seems that the last time I rejoined was almost exactly a year ago. Go figure. It is the same, but life outside of Facebook is different. The social world has really become more digital, and though I’m far more comfortable participating in it through bloggery, it sometimes feels like whatever I do in this space is not really participating in whatever the world has become. People in my own town who I have known for years and years, seem to communicate to one another almost exclusively through Facebook. "Catching up" the old fashioned way, which has always been pleasurable for me, has become kind of spotty during the past few years. Perhaps it takes too much time, or it makes people feel uncomfortable. Perhaps it all looks better in pictures than it sounds in words. I have learned over the years that in addition to being extremely dependable, I also really need social interaction. I like doing it with music, and the act of sharing music I have written feels really good, but then shortly afterwards, if I don't hear anything from the persons known and unknown who might or might not be playing it, I feel like I have created an open circuit with energy pouring out and going nowhere. When nothing comes back to me in the form of interaction, I feel empty and depleted. This is nothing new. I have always been this way. I never learn, and I never will. You would think that Facebook would be the perfect cure for such a state of being. If it were, I would be writing this missive on Facebook (and nobody would read it because it is too long and is not decorated with pictures of happy people having fun). Now that I am exploring Facebook again, I understand something about why the blogosphere has become so much less interactive in recent years. When you are in Facebook, that becomes the portal to the world (and to all worlds). It becomes the party where you spend your on-line interactive time (which is, for many people, their only non-work interactive time). If you want so share something, you keep it in the party. Why go anywhere else when you can spend your time peering into the lives of everyone you knew in all your previous lives without them even knowing you're looking? What the people at the party choose to ignore is that everything is done with the idea of people generating money by advertising and by selling ads to advertisers, and that the social lubrication is there to make the feeling of being "sold to" less overt and less offensive. Playing Dots has nothing to do with being creative. I think it actually dulls creativity. Going out for a walk, or reading, or practicing, or listening to music, or talking with people stimulates creativity in me. There is a lure of the shiny and the easy. Dopamine flows so easily, but it is an empty kind of dopamine. My cup runneth under, and I don't like it. I think my association with Dots has come to an end. I need to make a follow-up post about Dots. Yesterday I noticed that playing Dots seemed to help me to endure the hot flashes that take over my life and dampen my spirits (as well as my clothes), but today, now that I have a high score of 375 and understand how to use the tools of the game, the sweat on my fingers becomes annoying and slows me down. So much for a cure. I'll just have to endure, and know that there will be a time in the not-too-distant future when I will once again have a thermal system that I can count on. I have learned some interesting things from playing Dots and how it relates to life and music. Each game is a minute long, and some minutes are more productive than others. Some minutes are definitely more pleasurable than other. Some minutes seem to last a long time, and some minutes seem to last a very short time. Dots offers opportunities from the random configurations of dots that populate the game board, and it is up to me (or you) to take advantage of the "squares" that form. As in life, missed opportunities abound. In Life and in Dots, you see them in retrospect. In Dots you can use tools to eliminate dots from the board ("paid" for by the dots you earn by playing), thus engineering the coveted "squares" to appear. In Life you can set up situations so that they can be advantageous for you, and you "pay" for it by using the "capital" of experience or actual money (that you make by doing actual work, unless you live off royalties, an inheritance, or on investments). A minute-long game of Dots is like a little life. It begins, flourishes or fails, and then ends. In Music you also work with "lives." Every time you play a piece of music you give it a life. Every time you play a passage, you give it life. When you do it in private, it is a private life; and when you do it in public it is a public life. When you play by yourself, everything that happens is up to you, and when you play with others, everything that happens is a shared responsibility (even when the other person doesn't seem to be listening or engaged). Music also offers the same random opportunities that Dots offers. A passage of Bach, for example, can often be played in many different ways, and each phrase causes changes in the phrases that follow it. I doubt that even the most mechanical of human players can play a movement of solo Bach exactly the same way twice. And anyway, who would want to? Can playing Dots make a person a better musician? I suppose that has to do with what "better" means. Playing Dots is not a substitute for practicing. I do think that playing Dots can help with sight-reading though, because sight-reading involves observing patterns and playing notes in their proper horizontal and vertical order at a reasonable rate of speed. I think that playing Dots has helped me with sight-reading when I play the piano. There is a rhythmic flow to Dots when a game goes well, and if you take too much time to enjoy the multitude of visual and aural rewards you get, the game loses momentum and you don't get as high a score you would get if you simply enjoy the ride. The rhythmic aspect of music is obvious, since rhythm is one of the building blocks of music. Organizing music into long phrases is also kind of similar. So often we musicians look at the trees when we really should be looking at the forest itself. Sometimes, in order to make the real music happen, we need to let the trees take care of themselves (though we need to have everything technical under control before we can step back). There are people who play Dots competitively. There are people who live Life competitively. There are people who play Music competitively. There are people who play games for the fun of playing. There are people who live life for the fun of participating. There are people who play music for the same reasons they participate in the game of Life. Until last week I never used my iPad for playing games (aside from word games), but Michael introduced me to Dots, and I found myself entranced. When I figured out about the little rewards you get from completing squares of dots (there is a chord that gives you a tonal reward, the colors on the board change, and you get more points), I became a hard-core user. I can walk away from the game. I can accept my high score (250 to date). Like most women in their 50s, I am surprised (annoyed, plagued, haunted, angered, weakened, and thrown off balance) by hot flashes. Earlier this evening I went to sit out a particularly nasty one near the air-conditioner, and decided to play a game of dots to pass the time. My hot flash diminished instantly in intensity. After three or for games (one minute each), it was over. I was shocked (and delighted). I didn't actually stop playing after those four games, but when I did actually stop, I planned to test my discovery by playing dots as soon as I got the next hot flash. I sat down to play as soon as I felt my hot flash coming on, and once again, it was far less uncomfortable than usual. It also only lasted two or three games (i.e. minutes). I would like to believe that playing this game is actually beneficial for my mind, and that it isn't a true waste of time. [Yeah, right.] 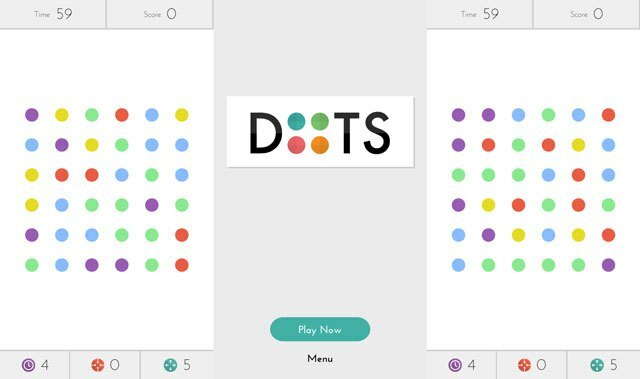 It is a game of speed that requires you to recognize patterns very quickly and connect rows of colored dots with a little sweep of the finger. Playing it causes changes in breathing and stress level, and the stress is punctuated with constant rewards, so I guess it is a good kind of stress. It is also something you can play with both hands (two hands are better than one), so it stimulates both sides of the body and the brain. Since hot flashes have everything to do with hormonal changes and imbalances, maybe the specific kinds of stress hormones that are produced by playing dots help to lessen their impact. Now, if I can only figure out a way to stimulate those hormones when I don't have my iPad in my hands! I have to admire the marketing that has been done to promote Sheryl Sandberg's Lean In, and I admire the way Sandberg admits her past tendencies to sell herself short in a corporate world where men still set the rules of the game. (No link is necessary for the book, since you have probably heard about it.) There has been some lively Sandberg-stimulated discussion comparing the problems that women have competing in the world of business with the difficulties that women have being recognized as equal players in the world of musical composition. I contributed to that discussion, but in retrospect I no longer believe that there is a true parallel. In the larger world, the field of "classical music" is terribly small, and the field of new music composition makes up only a tiny percentage of what we call "classical music." Automation has pretty much relegated those of us who write and play to small corners of the culture where we have to struggle to get some kind of compensation for our work. Most of us have to supplement our lives with extra-musical activity in order to survive, and those of us who are good at self-promotion probably spend as much time doing "business" as writing music. Or more. The men and women I respect most (in music and in other creative fields) tend to be people who don't spend their time on self promotion. While I was watching an interview with Sandberg on 60 Minutes Sunday night, I started to think that I might be guilty of selling myself short. Success is measured in sales and in salary in Sandberg's world. Her success is founded on generating more sales for her business, and her business is essentially about marketing stuff to huge numbers of people by way of a social network. She gets a huge salary for the work she does. In music composition there is no "salary negotiation." Conductors and principal players in orchestras can negotiate salaries, but like lower-level college instructors, most of the "rank and file" players have salaries that are not negotiable. Commissions can be negotiated, but most people know that if they commission a piece from a good composer of any gender, the piece will be of the same quality regardless of whether it costs $1,000 or $100,000. The proof of what a composer can do is in the music itself, and in that regard men and women are absolutely equal (though not all composers are equal: some women are better than some men, and some men are better than some women). Sandberg mentions that women often attribute their success to luck and hard work and not to their "skill set." Men, she suggests, attribute more of their success to their "skill set" than to luck and hard work. In music, skill is the active currency. In good music it is the only currency, and the only thing that matters. Success is measured in long periods of time by other people, but in short periods of time for the composer. I think of success phrase by phrase, but it might take ten years for anyone to notice. In the case of composers who are no longer living, it might take centuries for anyone to notice. My "skill set" does not include selling stuff to people. I have tried, and I have failed miserably. But I can create something out of nothing, and I can provide a medium through which people can express themselves individually and collectively. I can play to make myself happy (and feel other emotions), and I can play my instrument in a way that helps other people to feel. For those reasons I am extremely successful. Sandberg goes on to say that every woman she knows feels guilty about the choices they make. I don't feel the least bit guilty about the choices I have made. I am the CEO in my own creative empire. I make all the decisions about who plays what, at what tempo, and at what dynamic. I choose which notes stay, and I decide which ones have to be removed. I decide the lengths of phrases, and I command them to go where I want them to go. I choose the harmonic material, and the articulations. I feel all-powerful when I am writing music. Perhaps that's why I love to do it. [if you are looking at this in a reader, you should go here to listen]. 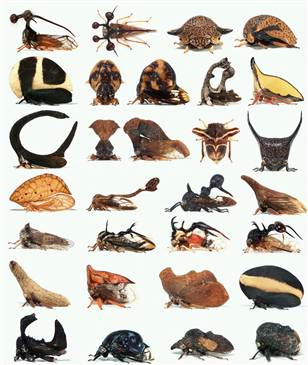 Most of us know what bees are, but the treehopper is a crazy-looking insect group. Here's another article about their strange helmets.